Seriously, couldn't he have tried to match the colour? The Adventures of Stan Lee's Toupee is the name of a short lived live action superhero show, shown on the Fox Network in 2005. Although initially popular, the show's audience soon dwindled. So low were the ratings that Fox executives defied their usual rule of only canceling good shows and canned it for good. Following the the huge financial and moderate critical success of the many film adaptations of Marvel Comics series, it seemed for a while that any Marvel character could be successfully auctioned off. Having sold the rights to Rocket Racer, HERBIE the robot and Sub-Mariner, Marvel figurehead Stan Lee found himself in a meeting with Fox execs with nothing left to sell them. In a desperate move, he placed his trademark toupée on the bargaining table. Fox bought the TV rights to the hairpiece for $3.2 million. WARNING: SPOILERS - Why settle for regular spoilers, when your car could have Warning Spoilers! Three warnings to choose from - "If you can read these, you're too close"; "Danger: High Voltage"; and "Beware - Driver Has Crabs"
Mild mannered legendary comic book creator Stan Lee, has a toupee, named Walt. Unbeknownst to Stan, Walt is secretly the superhero Captain Wiggy. Stan goes about his daily business in his fictional hometown of Kuala Lumpur, Walt keeps a keen eye out for crime. We are introduced to the other main characters - plucky female reporter Rita Zorkenheim, the ancient wizard Jehosephat, comedy relief steamroller driver Mustapha McDougal, and Stan's parents, Ma and Pa Lee. As all of the main characters sit down to Thanksgiving lunch, Walt suddenly spots the Wig Signal high above Kuala Lumpur. Realising that he cannot become Captain Wiggy in front of everyone, he calls in a domestic disturbance. Whilst the police are brutally beating everyone, Walt slips off to do battle with this week's villain, the Human Pinata. Captain Wiggy fights the villain over the city, eventually causing him to explode, showering Kuala Lumpur with paper mache, sweets and cheap plastic trinkets. We cut back to the Lee household, were the vicious police brutality has been cut short as everyone has gone outside to watch the battle. The police are so inspired that they leave without inflicting many more injuries. Stan then goes looking for his toupee, and finds Walt indoors. "Where have you been," he demands, "I saw Captain Wiggy again and, as usual, you weren't there." "Maybe I was closer than you think!" replies Walt. He then winks conspiratorially to the camera. Iris out, and roll credits. Everyone learns a valuable lesson. 1 - Attack of the Thanksgiving Burrito (Pilot) As above. 2 - The Coming of Girdlorr Captain Wiggy falls in love with William Shatner's toupee. Infuriated, Shatner's girdle (which was also in love with Shatner's toupee) irradiates itself with gamma rays in order to gain the power to destroy Stan Lee and Wiggy. In the end, everyone learns a valuable lesson. 3 - Five Minutes of Fame... AND DOOM! In a flashback, we learn that Stan Lee won Walt from Andy Warhol in a poker game in the late 1960s. In the present, Kualar Lumpar is threatened by the undead corpse of Dwight D. Eisenhower, who seeks to destroy everything connected to the sixties. In the end, everyone learns a valuable lesson. 4 - Attack of the Heart Men As Christmas approaches, Stan Lee and his toupee have to explain the true meaning of Christmas to Santa Claus, who is suffering from drug induced amnesia. As some villains get ready to make their move, Fox CEO Rupert Murdoch personally walks onto the set, cancels the show, and beats up the director and several of the actors. In the end, everyone learns a valuable lesson. 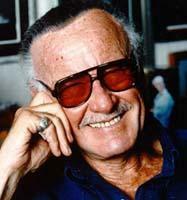 The Adventures of Stan Lee's Toupee is part of Uncyclopedia's series on Mass Media.